Clovelly Electricians Can Be A Real Lifesaver! Clovelly Bay is home to the first surf lifesaving club in the world. But sometimes life’s dangers are lurking on land as well. Electrical problems in a building could cause fires, shocks, property damage and even serious bodily harm. If you suspect that you’re dealing with electrical problems in your home or workplace, it’s time to call on the professionals. That’s when the friendly and affordable services from Randwick Electrical can be a real lifesaver. Finding electrical faults ahead of time can eliminate major problems and expenses down the road. Our qualified technicians take all the necessary steps to ensure that your business or residence is not only safe but running in optimal condition. These steps include collecting evidence, analysing evidence, locating faults, determining and repairing causes, and then running safety checks. 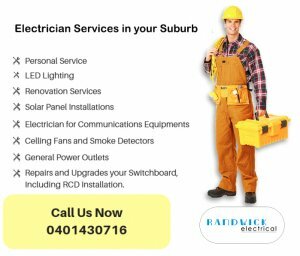 If you suspect electrical faults in your home or workplace, call Randwick ASAP. Randwick Electrical Services is not only your go-to team of electricians in Clovelly. We can offer advice and provide installation and maintenance on a range of alarm systems, security systems, door entry systems, and CCTV systems. We are a highly experienced team of local electricians who understand that you want a reliable and cost-efficient solution to your problems. Look no further than Randwick Electrical Services when choosing an electrician in Clovelly. For a no-obligation quote, or to simply ask us a question about your electrical requirements. We pride ourselves in giving straightforward answers. Ever seen the movie “Brazil” by Terry Gilliam? When Robert De Niro’s character opens the ducts in Sam’s apartment, he spills shoddy wiring everywhere. In the movie it’s hilarious, but if one of our electricians saw that job they’d be horrified! In real life, messy electricians are a hazard. So, hire Randwick for your electrical needs and rest assured that the job will be tidy from start to finish! DeNiro’s character got there in the end—but Randwick Electricians get there from the start.